Update: Office 2011 is now available on the Home Use Program (HUP) site! Let us know if you have any further question, thanks! "Office for Mac 2011 will be made available worldwide on December 9, 2010." This shows how to open the login window files. It requires Apple's Developer Tools, which can be downloaded here for free if you have a free developer account. I don't completely understand how the login window elements work together, so anyone with more knowledge can chime in through comments and I'll update this post. I do know these steps have worked since Jaguar (10.2) with some tweaks to the file location and without the compiled .nib file errors introduced with Snow Leopard's spring cleaning. I recommend making a backup of the original .nib file. That way, if you somehow mess up and the login screen will not let you in, you can alway start up in Single User Mode and replace the copy with the backup. I also did all the changes through my root user so I didn't have to authenticate every change I made. Right-click on loginwindow.bundle and choose "Show Package Contents". In the new window that opens, navigate to Contents/Resources/English.lproj/. If LoginWindowUI.nib shows as a folder, open and close Interface Builder, thus associating the .nib filetype. Open LoginWindowUI.nib and begin editing. In Snow Leopard, the first time you do this, you will get the below error. Look here for information on how to get around this. "The document "LoginWindowUI.nib" could not be opened. 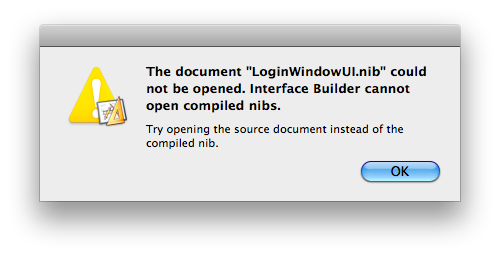 Interface Builder cannot open compiled nibs. Try opening the source document instead of the compiled nib." First, download and unzip this, which has dummy versions of both needed files. Right-click on the file you want to edit and choose "Show Package Contents". A new window should come up, and there will be one file, keyedobjects.nib, listed. Copy classes.nib and login.nib into this folder. You should now be able to open the original .nib file. These are instructions to change your default command line editor in Snow Leopard. The file /Users/randomuser/.profile does not exist. These are instructions to quickly and easily enable PHP on Snow Leopard. I won't discuss any other configurations on this post beyond those necessary to get PHP running. Remove the hash mark (#) to uncomment that line, then save and close the file. In emacs, this is done by pressing Control-x Control-s (save) followed by Control-x Control-c (close). PHP should now be up and running! These are instructions on how to start, stop, or restart the Apache web server on Snow Leopard. Open the Sharing prefPane in System Preferences. The checkbox by "Web Sharing" indicates if Apache is started or stopped. To start Apache, check the "Web Sharing" box. To stop Apache, uncheck it. To restart Apache, uncheck then check it. To test the status of Apache, visit http://localhost in your browser. If the page loads, Apache is started; elsewise it is stopped. These are instructions to quickly and easily install MySQL on Snow Leopard, and will also work on Lion. I won't discuss mysqladmin or any other configurations on this post beyond those necessary to get the MySQL server running. Visit http://dev.mysql.com/downloads/mysql/. Make sure the platform is "Mac OS X". Let the .dmg file download, then open it. There should be a file called something similar to mysql-5.1.52-osx10.6-x86.pkg. Open it. Click through the installer with the default settings. The installation took about 10-15 seconds. The files install in /user/local/mysql/, so we need to set PATH variable to look in there. Create or edit a file in your home directory called .profile (make sure you include the ".") using TextEdit or the editor of your choice. MySQL should now be installed and ready to use. Return to the mounted disk with the MySQL installer. Double-click on MySQL.prefPane. It will install after you authenticate. Visit http://www.sequelpro.com/ and click the "Download" button. Let the .dmg file download, then open it. Drag Sequel Pro to your Applications folder. Visit http://dev.mysql.com/downloads/workbench/. Make sure the platform is "Mac OS X". Drag MySQLWorkbench to your Applications folder.